Meeting procedures in the Central Coast Council chambers set to change. The former Gosford Council’s draft financial accounts for 2015-16 have included a $1.389 billion reduction in the value of its assets to around $9.6 billion. They have also revealed “serious control weaknesses” that meant Central Coast Council could not vouch for the accuracy of some balances in the reports. Central Coast Council chief Mr Rob Noble said asset valuations and the “control issues” had resulted in matters being referred to unnamed “third parties”, understood to include the Independent Commission Against Corruption. “The reason why we have been obliged to report to external agencies is because of these control issues and significant changes in valuations. 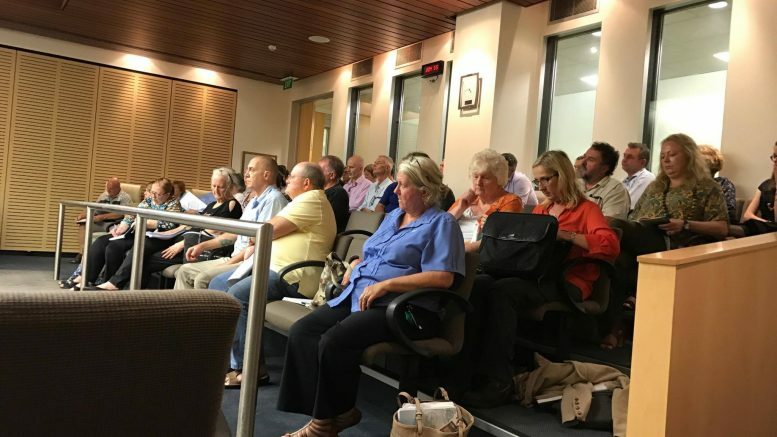 “It will be up to those parties to determine whether they want to inquire further, hand it back to the Council to do more of its own investigation or take no further action,” Mr Noble said. Mr Noble said there were two key elements in the apparent inflated valuations of some assets. “The first one really related back to about 2010 to water authority assets when there was a double counting of sewer manholes from 2010, so that we had to make an adjustment now for the prior year error,” Mr Noble said. He said the remaining part of the asset write down related to 2014-2015 year when $720 million of bulk earthworks assets could not be verified by the staff team putting the draft financial reports together. According to Mr Noble bulk earthworks included asphalt, tar, gravel, lime and all the other materials used to build roads. “The former Council did a revaluation as they were required to do. “We are legally required to revalue all our fixed assets on a periodic basis to make sure we are describing them on a fair value basis, but it did not look right,” Mr Noble said. “It looked to be overstated so our staff started inquiring into that, looking at the standard methodologies for valuing bulk earthworks,” he said. Land under roads was another category of asset that was written down in the draft financial accounts. “It is a little bit hard to answer this one because there was $74 million worth of an asset showing on Gosford Council’s books that had insufficient data or records …to demonstrate what that particular supposed value actually applied to. In answering a question about how such a miscalculation could occur, Mr Noble said: “I don’t know the answer to that question and nor do my finance staff. “They just don’t know why that figure was sitting there when there were no supporting documents. “We would have needed to see some documentary evidence of a connection between the $74 million and evidence of ownership of land under roads somewhere in the Gosford Local Government Area,” he said. In addition to the total $1.389 billion asset write down, the other major issue revealed by the draft financial accounts of the former Gosford Council was described as “significant weaknesses in fundamental information technology and other internal controls”. security controls that enabled a limited number of officers and software vendors to script changes, deletions or additions into the financial tables contained within the financial system without any effective control reporting or audit trail. “The apparent absence of such controls is unusual and not expected in a sophisticated and large government entity such as the former Gosford City Council. In response to a question about how such security issues could have been allowed to arise, Mr Noble said: “We don’t know the answer to that. “We know they existed. There was a lack of ability to track changes that were related to our corporate financial data,” he said. The draft reports stated the Central Coast Council had no way of knowing whether changes had not been made to the data. Under the NSW Local Government Act the financial statements of the former Gosford Council, up to its dismissal on May 12, 2016, must be certified by senior staff as presenting fairly the Council’s financial results for the period. This certification is meant to ensure those senior staff take both responsibility for and ownership of the financial statements. It has rewritten the prescribed statement required under the Local Government Act to deal with the unusual nature of the draft accounts and has provided ‘caveats’ above the spaces for the signatures of Mr Noble, administrator Mr Ian Reynolds and chief financial officer, Mr Stephen Naven.